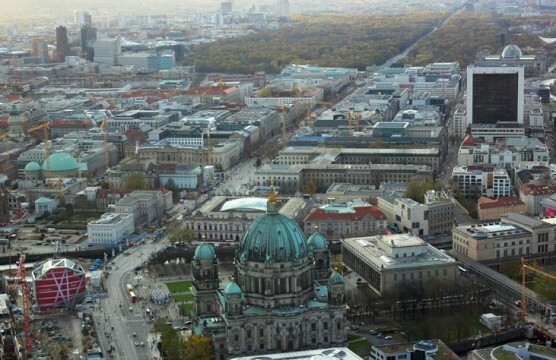 Berlin was a city that always fascinated me. It’s a city that is full of historic events and landmarks that will forever live in the memory of everyone who has had the chance to experience them. After researching the German capital in preparation for my weekend break a couple of years ago, my itinerary included the Berlin Wall, Checkpoint Charlie and The Olympiastadion. I wanted to delve a bit deeper though. I’m the sort of person that wants to see everything physically possible. It’s not usually doable, but with the Berlin TV Tower you can. I expressed to my family that it was of upmost importance we visited the Tower. I persisted and finally got my wish. The great thing is that this isn’t just a TV Tower that has a beautiful view of Berlin. This tower has a sphere design which has a 360° rotating café located at the very top. After 30 seconds in the lift, we reached the observation deck which is roughly 203 metres high. I’m not a great lover of heights and so was keen to get straight into the café. Entering the café was a moment to behold. My instant reaction was ‘WOW’. The café was classy and elegant with top of the range furniture. To be honest I didn’t expect anything less after reading the reviews. Luckily we had a table right near the window which was a stroke of luck. I didn’t take my eye off of the view as the sphere slowly revolved around, giving me the perfect view of the beautiful city. 203 metres up and everything felt so peaceful. I could have sat their all day watching the world go by as I enjoyed a slice of cake and a coffee. The café in the Berlin TV Tower will be forever ingrained into my memory. If you’re planning a break to the historic city of Berlin be sure to put the TV Tower on your to do list. Like what you read?? Be sure to let us know what you think.